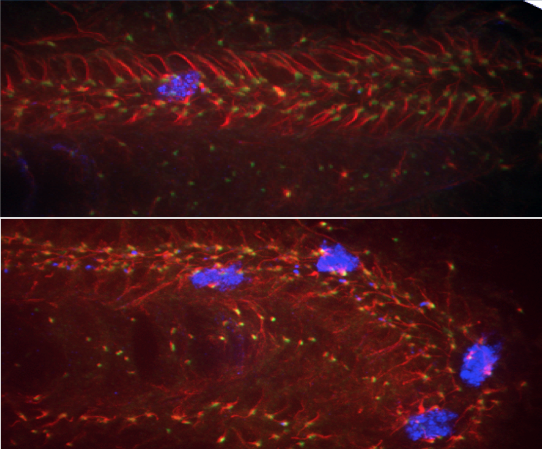 More mitotic cells (blue) are observed in a centrin2 depleted embryo (bottom panel) than in a control one (top panel). Bénédicte Delaval is interested in understanding the cellular mechanisms controlling cell division and how the disruption of these cellular processes influences the initiation and progression of pathologies such as cystic kidney disease and cancer. More precisely, she and her group are combining cell biology and biochemical approaches in cultured cells with an in vivo model organism, zebrafish, to understand the role of centrosome and cilia proteins under normal and pathological conditions. The centrosome is a dynamic organelle that is essential for controlled cell division. During the cell cycle, the centrosome acts as a platform for assembling proteins and pathways that control cell cycle progression and cell proliferation. In mitotic cells, centrosomes/spindle poles contribute to mitotic spindle organization and orientation. Maintenance of centrosome integrity and asymmetric centrosome segregation is thus important for proper cell division and controlled stem cell renewal. In non-cycling cells, the centrosome/basal body contributes to the formation and maintenance of primary cilia, sensory organelles that have critical cellular and developmental functions. Both centrosome and cilia defects have been observed in an increasing number of pathologies, including cancer, microcephaly or ciliopathies. Ciliopathies are complex genetic diseases which name comes from the fact that those diseases have long been associated to cilia defects. They are characterized by multiple yet common clinical manifestations including polycystic kidney disease, retinal degeneration, diabetes, obesity, skeletal dysplasias or cerebral anomalies. However, the cellular mechanisms underlying many of the clinical features of ciliopathies have yet to be fully elucidated. Bénédicte Delaval and her team are investigating how cellular defects associated with centrosome defects can participate to the initiation and progression of these pathologies. More specifically, they are trying to understand the normal and pathological role of proteins known for their role at the primary cilia and their involvement in pathologies such as polycystic kidney disease and cancer. Cilia proteins of the intraflagellar transport (IFT) machinery were initially identified for their link to polycystic kidney disease. One of them, IFT88 was also described as a potential tumor suppressor suggesting that common cellular pathways, which have yet to be characterized, might contribute to both pathologies. Cystogenesis has long been associated exclusively with cilia dysfunction. 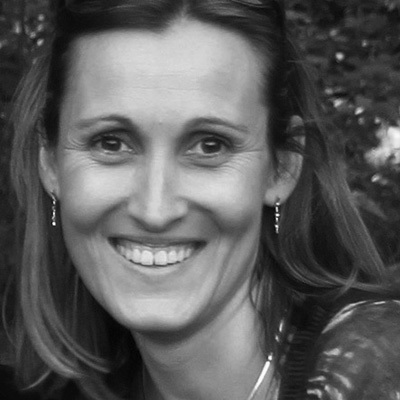 However, Bénédicte Delaval’s finding of IFT88 functioning in mitosis and the fact that several IFT proteins interact in mitosis and localize to specific sites in non-ciliated mitotic cells suggests that cilia proteins might have cilia-independent functions in dividing cells that have yet to be explored. Using cell biology and biochemistry in cultured cells combined to zebrafish as an in vivo platform to study cellular processes associated with normal and pathological tissue morphogenesis, she and her group are currently investigating the role of cilia proteins of the IFT machinery in dividing cells and thus, tackling form a different angle, the longstanding question of their implication in pathologies. 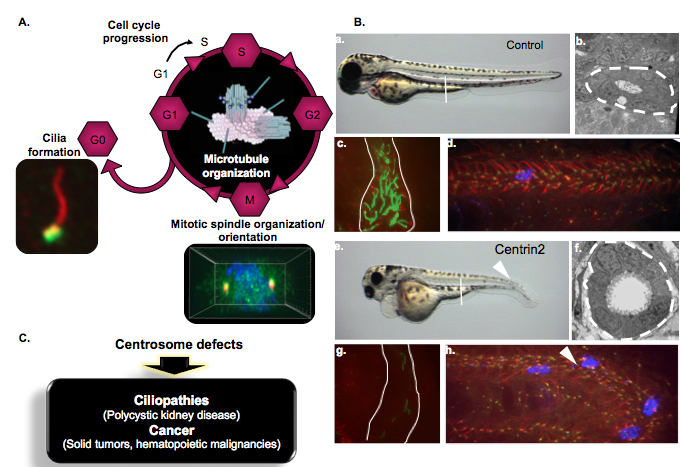 3) Zebrafish disease models of ciliopathy, cystic kidney disease or cancer are closely related the respective human disorders. Overall, this project has the potential to uncover novel cellular pathways contributing to both benign cyst formation and cancer. Moreover, given the ease of drug screening in zebrafish this project could open doors for therapeutic approaches for these pathologies.